Sad story: I thought the Dakotas were kind of in the middle part of the United States. Imagine my surprise when I realized that North Dakota actually touches Canada. Woah. This coming from the girl with the globe obsession. Well anyway, now I'm thinking I need to get myself this infographic map (because it made Jas and I laugh right out loud and we love it) and do me some learnin. haha this is so awesome although I like Fashion Bloggers should be in Utah! I love this! oh my gosh i need this!!! ahaha i love this map. i'm stealing it. This is awesome. Hot. I love it. Although some of the facts are sad on it. The Obesity, the serial killers...of course it's just a generalization though. Oh my goodness this is hilariously accurate. I can say it's true for Oregon and Washington since most of my life is in that realm. Thanks for sharing! 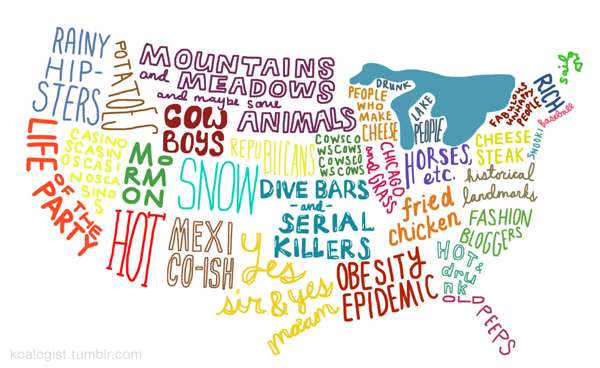 Haha this is funny.. although, being in the state with the serial killers.. not so much!